Brommer Sanitation and the City of Sioux Center joined together in 1974 with the first city contract for the manual residential garbage collection system. Garbage collection is on Mondays, Tuesdays, Thursdays and Fridays beginning at 6:00 AM. Residents of Sioux Center should have all materials in their can and out for collection by 6:00 AM on the scheduled pickup day. If garbage is not out in time for regular collection, it can either be picked up the following week, or you may request a special pickup (for an additional fee). In 2002 Brommer Sanitation and the City of Sioux Center switched to the one man automated garbage collection system. 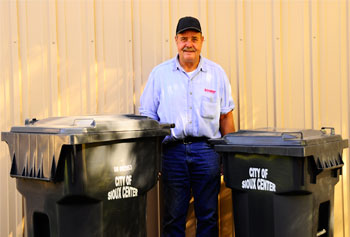 Alvin “Butch” Kruid has been with Brommer Sanitation since 1969 riding on the back of the garbage truck picking up trash until 2002 when Brommer Sanitation partnered with the City of Sioux Center and went to the Automated Garbage Truck system with the new grey city cans.